I’m excited to announce something I’ve been working on for quite a while now. 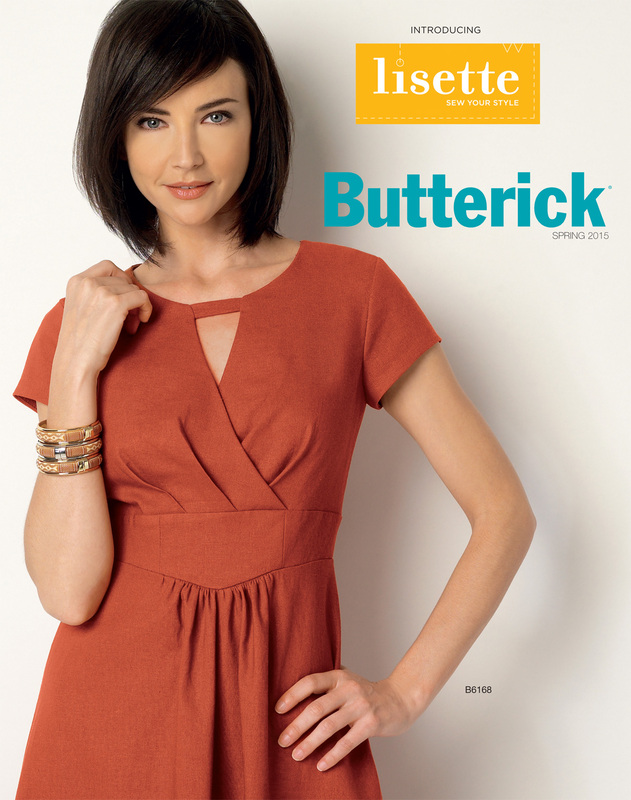 Our newest collection of women’s patterns is being released this spring with Butterick! They will begin arriving in stores soon. For the past year or so I’ve been putting a lot of thought into designing a collection of core wardrobe items for women. The idea of the core wardrobe has really become very popular in the past few years, and with very good reason. It’s a way of thinking about your wardrobe that is very popular in Europe and here in New York, where we have very small closets and need our clothes to be extremely versatile. No one-trick ponies here! The idea behind a core or capsule wardrobe is that all your clothes play nicely with each other and can be mixed and matched to create lots of outfits. In designing these patterns, I wanted each piece to be basic enough to wear multiple ways while also being fun to wear, with great details to keep them from becoming boring. In this first collection of patterns, you’ll find simple tailored trousers, a pleated skirt, easy pull-on tops and dresses with flattering silhouettes, as well a my favorite item: a fully-lined moto jacket with all sorts of great details! All of these pieces are appropriate for work as well as casual wear, and they can even move into evening if you make them in the right fabrics. And you know how I feel about clothing. I like updated classics, not trendy pieces that will look out-of-date in six months. So these patterns are designed to look great for a long time, and I hope you’ll enjoy wearing them for a long time too. 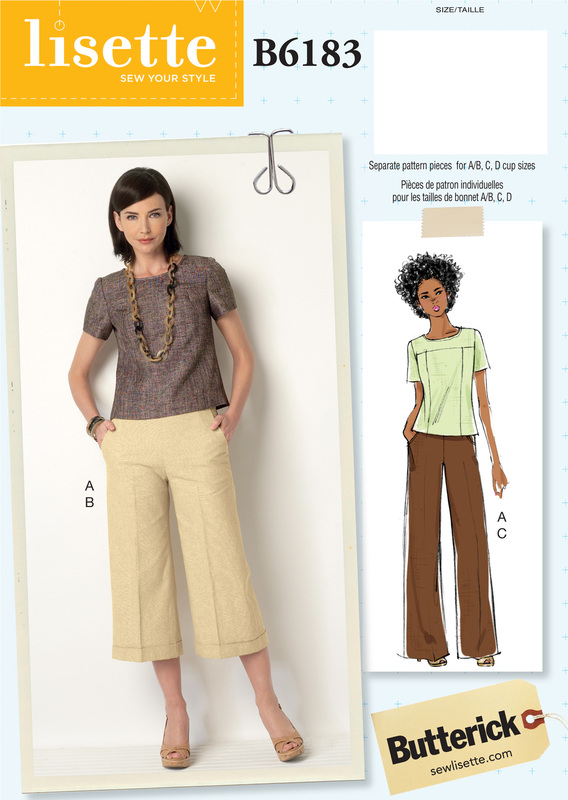 Let me introduce you to these new patterns individually so you can get acquainted. B6183 is a semi-fitted (meaning that it has a nice shape but isn’t tight), pull-on woven top with a jewel neck, princess seams, self-lined front and back yokes, and an exposed-back zipper. This pattern includes pieces for A/B, C, and D cup sizes, so the full bust adjustment is already done for you! And the princess seams are really easy to fit if you want to customize the pattern any further to fit your own body. The tailored wide-legged trousers have a waistband, side-front pockets, and an invisible side zipper. The trousers can be sewn cropped like in the photo or longer like the illustration, so they’re really versatile. And they look so cute on! I love this style because it looks good on pretty much everyone–even the rear view is flattering. I was really careful to make sure these were cut so they don’t scoop at the inside leg to create a bell bottom leg; instead, they have a gentle flare that gives the rear end a little lift. B6168 is a semi-fitted dress or tunic with a pleated cross-over detail and V-neck with a cute little front neck tab. We took special care to give these styles a really nice finish on the inside without requiring a full lining, so the front midriff detail is lined, as are the short sleeves. This dress has an invisible back zipper (my favorite kind of zipper to sew and wear). This dress is comfortable and flattering so it’s great for work or for casual wear, but it can also be sewn in dressy fabrics for fancier occasions. Wouldn’t it be pretty in silk dupioni? B6182 is a relaxed pull-on top or dress that has a center-front seam and a fun center dart detail, kimono sleeves and sleeve bands, and an easy fit. The safari-inspired A-line skirt has a wide waist band (which works so well with the shorter top or with a tucked-in blouse), side front pockets, a deep center-front pleat, and an invisible back zipper. And I saved my favorite for last! B6169 is a fully-lined moto jacket with all the trimmings. You’ll wear this jacket everywhere. It can go to work in place of a blazer, throw it on over jeans for the weekend, and you could even make it in leather if you’re feeling adventurous. The pattern includes lots of great details: princess seams, in-seam welt pockets, an exposed zipper, and two-piece sleeves for a comfortable fit. But don’t miss the dress, either. It’s a relaxed pull-on style with gentle gathers at the shoulders, self-lined yokes for a nice finish, princess seams to help with fitting and also to disguise the in-seam side-front pockets, and a shaped hi-lo hemline. You can make it with or without the sash. This dress would be so pretty in silk or rayon. I hope you have lots of fun and get tons of wear out of these patterns! I’ll be back with all sort of ideas for these patterns soon. Oooh, Liesl, they are lovely. The jacket is very very groovy. I will be looking out for these. I love the first dress and I am wondering why it does not have the extra pattern pieces for a D cup figure? I would love to make it but I am not great at pattern adjusents for my full bust. The patterns all look interesting and very wearable. I want them all! Love these! I was wondering will you also be creating fabric for Jo-Ann Fabrics again? If so, I hope that orange print used in B6182 will be included, I need that fabric! Barbara, I’ll do a full bust adjustment when we do the sew-along for the dress. And Isaspacey, the buyer at JoAnn didn’t purchase our last collection, so we don’t have any fabric going into JoAnn in the near future. But you never know?!? B6169 is my favorite! I love the jacket. Thank you, Liesl! I’ve ordered B6169 and B6183. I love that jacket! I’ve only made one lined jacket before so I’m looking forward to seeing how this one is done. For B6183, I think I might try the trousers as shorts first. I love that the top comes in different cup sizes! I love the dress (B6168) but will you have a sew-along with a small bust adjustment? I can’t figure out how I would do it with the cross-over detail. All very beautiful though! Ordering now. Love the styles but I wish more styles came with different cup sizes. I am only a D cup but that combined with my shoulders is enough to need an FBA. Love the dress 6168 but would not know where to start to do an FBA, so for that reason alone I will not be sewing that (but I love it!). Just something to think about……. Can you please let me know if and when these will be available in Australia I ducked into our local large fabric shop yesterday and no sign of them of the books but I also understand we are off season to you. Will that mean they won’t be readily available til later in the year??? I hope not! Penelope, patterns from the large manufacturers are typically released six months later in Australia because of the difference in our seasons. So they should be hitting stores there in about six months. In the meantime, you could always order from the US and have them shipped if you just can’t wait.